To kick off my posts about Kickstarters (both good and bad) that I’ve been involved in, I decided to start on a positive note with Triple Ace Games Kickstarter for their Ubiquity powered Leagues of Cthulhu game; this is a sort of spin-off of their Leagues of Adventure and Leagues of Gothic Horror books that posit a sort of League of Extraordinary Gentlemen style game using the Ubiquity rules system. I backed both of these and was very happy with the products received. Although I haven’t received my print copy of Leagues of Cthulhu yet (as of time of writing), the way that the Kickstarter has been managed has been very professional at all times, unforeseen delays are occasionally unavoidable but there is always a monthly update (sometimes more than one if needed) to let the backers know what is going on and keep them up to date. Following an update on 15th January 2018 saying that the shipping phase was beginning, the creators responded promptly to queries in the comments section by backers, explaining that they were currently awaiting postage labels before the books could be sent out. IMO this is a model of how Kickstarters should be run, anyone thinking of running one themselves could profit by following Triple Ace Game’s example, people will generally be understanding if unexpected problems or delays arrive as long as you let them know. Kickstarter is a great thing, there can be no doubt about that. Many games and RPG products that might never have make the leap to published, finished article if it weren’t for the funding provided by backers via the site. However there is a darker side to backing products on the site, for every person who talks about the great product they got, there’s someone else who has a story about how it’s been three years since a campaign was funded and they’re still waiting for any sign of the finished article. I’ve been fairly lucky and have only backed a few projects where the creator has spectacularly failed to deliver and/or has skipped town with backers money and a long list of excuses, most of my experiences with the site have been pretty positive (mostly because I only tend to back stuff where I have experience with the creator or that has been recommended to me by someone I trust). I’ve decided to highlight some of the Kickstarters (both good and bad) that I’ve experienced in a series of future posts. I have two great RPG loves in my life, one of these is the Fate RPG by Evil Hat Productions and the other is OSR gaming, something about the basic nature of OSR rules supplements really speaks to my style of gaming, I have numerous systems such as Basic Fantasy, Swords & Wizardry (core, White Box and complete), Lamentations of the Flame Princess and a few others. 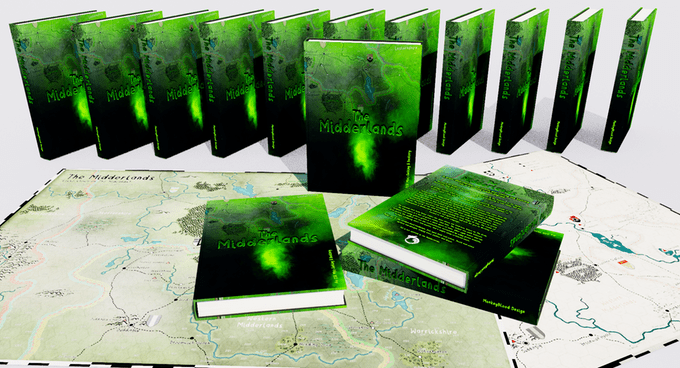 If you keep up with my social media then you’ll know that recently I back Midderlands, an OSR sandbox and mini-bestiary book set in a twisted version of the Midlands in the UK in the late middle-ages, as someone who actually lives in the real-world Midlands–and as a lover of OSR stuff–needless to say I was intrigued. The book is designed principally for Swords & Wizardry, but should work with any OSR style game, personally I was thinking of breaking out my Lamentations of the Flame Princess book and running it using that; from the small amount of preview material I’ve seen the setting has elements that reminded me both of some of Lovecraft’s iconic odd settings (Innsmouth anyone?) and also cult game Fallen London, which has it’s own skewed take on urban Britain. As of the time of writing the project needs another two and a half thousand pound (GBP) to reach it’s funding goal, with only three days remaining, personally I’m hoping to spread the love a bit and get some other people on board since I think this looks like an excellent book and deserves a chance to be published. So if you’re looking to scratch that weird OSR itch or you wants to take a journey through the odd places of a middle-England that never was, get yourself over to the kickstarter page and sign up now.